My wife says that my blog is a little bland - it needs more color. She probably thinks all the number stuff is pretty boring. Since I'm not going to change that, I've decided to start posting a few pictures after every tournament. Most of these from the WWC are courtesy GettyImages. 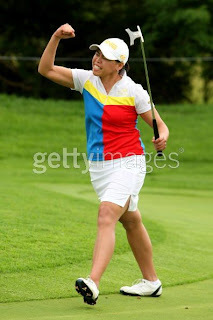 Dorothy Delasin after her birdie at 17 on Sunday. 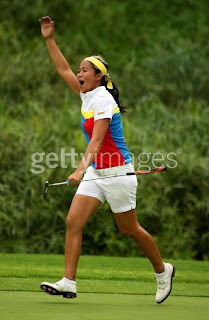 Jennifer Rosales celebrates the Philippines victory. Ji-Yai Shin and Eun-Hee Ji of Korea. 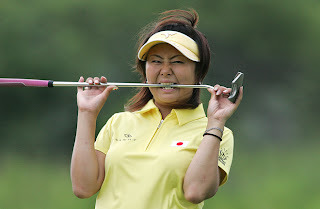 Miki Saiki of Japan reacts to the horn signalling the approaching bad weather. 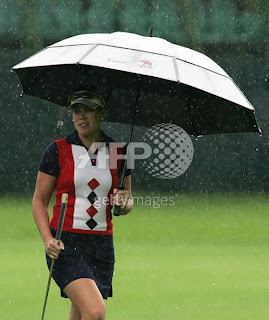 Celeste Troche of Paraguay attempting to keep dry. 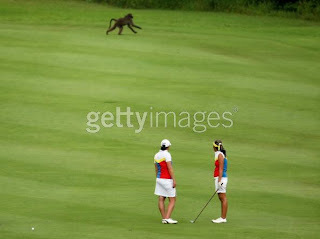 That monkey photo reminds me of the time my Dad and I went golfing at a course in Orlando. They told us no matter what, don't try to retrieve your ball from a water hazard. They were full of water moccasins.